Hello and welcome to my Yaesu FT 102 webpage. 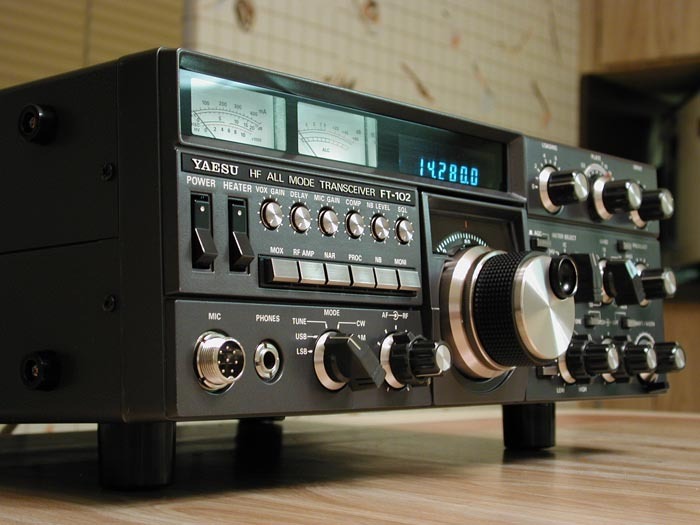 There are several pages of information about the Yaesu FT 102 located here along with some photos for your enjoyment. I have also started a modification series. These will be simple and easy to do mods that will make your set more useful and operate better. The pages regarding information are linked in yellow below and the modification pages are linked in red. All you have to do is click on the link to get the page. See below for the new AM SURGE MODIFICATION #8 below in red. Some of the earlier models of the 102 had a problem with Key Clicks on CW. By serial number 050xxx Yaesu had it cleaned up. Let me suggest that when working CW and after you tune the transmitter, cut the Drive control back until the ALC no longer comes up off the peg. At the same time make sure you still have maximum power output. It is an easy adjustment with the two meters and the Drive control. This will give you very sweet CW characteristics with beautiful shaping of the leading and trailing edge of your CW note. This will eliminate Key Clicks in the early models and make the later models sound even better. If you need to contact me by email my address is NC4LMal@aol.com. If you have other questions please call me at 954-961-2034. 2. - Suggestions to get the best from your 102. 3. - Important info on blowing fuses.